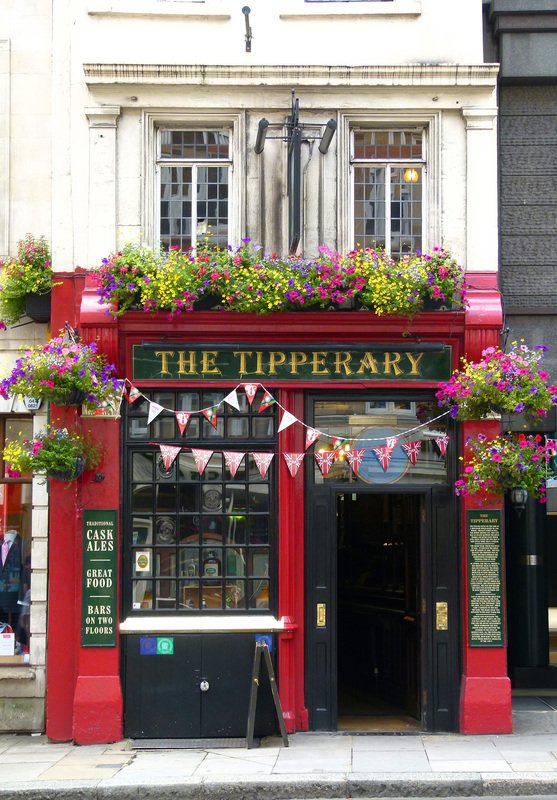 Fleet Street is home to some of the capital’s most historic pubs- one of which is The Tipperary. The spot upon which this wee pub sits is a location which has long been associated with boozing. Way back in the 13th century, the land was occupied by the ‘White Friars’ monastery- where the pious monks spent considerable time and effort brewing ale. White Friars monastery, as seen on the ‘Copperplate’ map in the 1550s, shortly after the Dissolution. After Henry VIII kicked up a fuss in the 1530s and 40s, such monasteries were wiped from the landscape and the land upon which they stood was turned over to other purposes. By the 16th century, the first tavern had appeared on the spot now occupied by The Tipperary. This forerunner was known as The Bolt-in-Tun (the pub sign outside signalling the name with an image of a lightning bolt stuck through a barrel) which, having been built from tough, flame-proof stones belonging to the former monastery, managed to survive the 1666 Great Fire of London intact. The Bolt-in-Tun eventually became a popular coaching tavern for those traveling between London and the West Country. In the 1880s, the pub was re-built and renamed The Boar’s Head. However, a reminder of the previous name can still be found across the road- a small alley called ‘Bolt Court’. Perhaps the most interesting fact for alcohol aficionados though is that the Bolt-in-Tun was purchased in the 1700s by Mooney’s– a Dublin based company. Once the pub was in their hands, the new owners decided to introduce a new drink which had recently become popular back on the Emerald Isle… a sturdy, black stout, so rich in iron that it was said to be ‘good for you’… the drink was Guinness, and its introduction at the Bolt-in-Tun made the Fleet Street pub the first ever drinking den to sell the now world-famous drink outside of its native Ireland. One of Guinness’ many famous, classic posters. During World War One, what was essentially the capital’s first Irish pub attracted many young Irish soldiers as they passed through London. Such was the popularity with the Irish squaddies who were a long way from home that the pub was re-christened The Tipperary… the name which remains to this day. The present day sign for the Tipperary on Fleet Street. Did Money’s make their Guinness locally or import it from Ireland, I wonder? There has always been a claim, fictitious as far as I know, that Guinness made in England is weaker and not as good as that made in Ireland. Certainly, when I went to Ireland I could detect no difference. I imagine it was imported back then. I’ve tried Guinness in Northern Ireland, and I must say it did taste a lot creamier; was delicious stuff. Might have just been a particularly good barrel though! Great post. My family is Irish so always find it interesting to see long connections going back between London and Ireland. Thanks, MetroGirl- hope you get to have a drink in there sometime! Great post, CabbieRob! I had my first Guinness in London (The Euston Flyer on Euston Rd. )… and it won’t be my last. Thanks for recommending it as a creamy dark brew – it certainly was delicious. Next time we get to London, the first pint’s on me! Ah, glad I helped you discover it! Is it easy to find in the States? Hope you’re still able to get your fix! Would be very interesting to hear how Guinness tastes Stateside, look forward to hearing the results of your research! Being from Ireland, I cannot let a week pass without Guiness 🙂 Creamy dark blue is one of the best, but I still prefer the bitter one. Thanks Greg, I know where you’re coming from!